Have you ever wondered what it's like to run in Barcelona? Just press start. When you purchase an iFit® Coach membership, you get VIP access to the best in fitness technology. Top features include Google Maps™ workouts that take you anywhere in the world. Whether you choose a route from our vast collection of pre-drawn trails or draw your own course, iFit® Coach sends the route straight to your treadmill for a unique, fun, and completely personalized experience. iFit® Coach also sends you a brand new workout every day, designed by certified personal trainers, making it so you’ll never get bored. This ever-growing workout library offers programs that progress with you from beginner to marathoner. And with automatic tracking, you can keep a close eye on your fitness evolution. This large-frame Mach Z™ Commercial Plus Motor stays cool through the toughest workouts; creates high levels of inertia for a smooth, powerful feel; and promises a quiet in-home experience. Great for heavy use, this motor is built with high-grade components proven with our lifetime motor warranty. Walk, jog or run your way to incredible results! 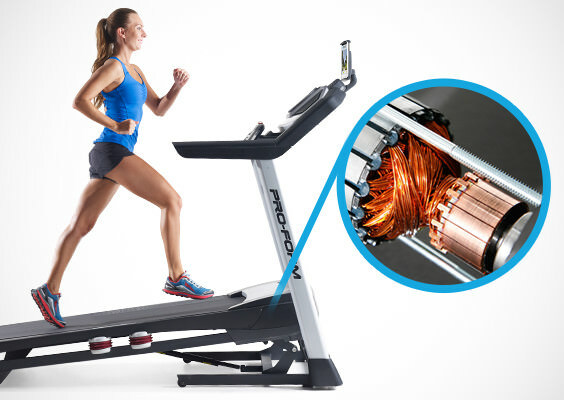 This extra-long treadbelt is a first on an incline trainer! It's perfect for every foot strike, long or short strides, and is built to withstand mile after mile. You can stretch out your stride and reach your goals! Keep cool while you drop the pounds with this built-in fan. Quick console controls allow you to adjust the speed at any time! Reach your weight-loss goals fast with workouts designed by a Certified Personal Trainer. Each workout will help you burn maximum calories with preset speed, incline and time settings. This heavy-duty treadmill is built to withstand heavy use; it accommodates up to 150kg. Reduce impact on your joints and burn more calories with incline training. Take the deck up to 12 percent incline with just the touch of a button. Attach your tablet to your machine so you can enjoy your favorite shows, music and movies while you workout out. 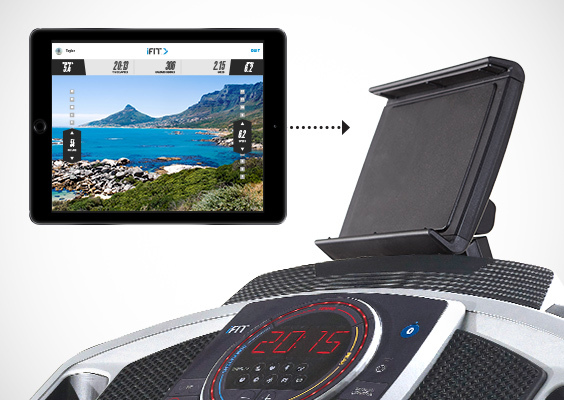 This tablet holder sits above the console so your entertainment doesn't interfere with your workout. Work out at your speed with a motor that responds to any type of training. The Mach Z™ Commercial Motor delivers incredible power for intervals, speed training or an endurance run. This motor reduces noise as it cools internal components and is ideal for a family or those who enjoy long workouts.